Some part of the world (mainly said this topic is really sensitive due to some result created next) has said that this can't be discuss openly. Lots of people says that they're not racist (but are they really practice what their speak?). Although people whose ancestors came from different geographic regions look different, no scientific or biologic evidence exists to support even the idea of race. Not surprisingly, it is rare, today, for a person to admit to being a racist. 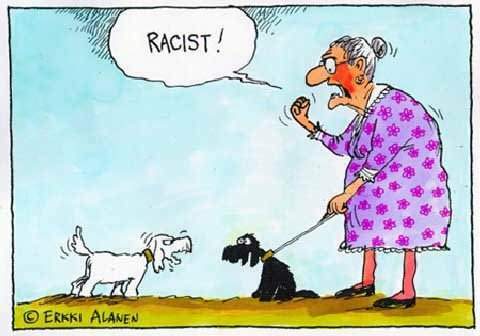 Despite the prevalence of racism (the belief that members of a particular "race" or ethnic group share common qualities), the word "racist" has acquired a very negative connotation and is even somewhat pejorative. It is even rare for people to openly espouse racist philosophy. Someone can be a racist regardless of their religion, intelligence, cultural level, social status, benevolence towards members of their own race or social motivation. Racists come from all races (sometimes the race which they feel they belong to may not be obvious). Racism is thus only implicit in behavior. What are the signs? Reducing people of other races to racial stereotypes. This can often be done in very subtle ways. For example, confusing race with culture, a belief that certain races are more adept in particular jobs or functions, a belief in differences in intelligence between the races, etc. Advocation of segregation. This advocation represents a belief that different races should live apart, be educated separately or not intermarry. The advocacy can occur explicitly or implicitly. Association. It is common for racists to associate with other racists. While not necessarily espousing racist opinions themselves it is common for them to personally defend other racists (without directly defending their opinions). Belittlement of members of other races. Racist will constantly criticize the opinions of other races or even ridicule them. Often they will do it without explicitly making mention of the race of the person or persons. Latent hate. An exaggerated reaction to any misconduct from a person of the other race, where the punishment is out of all proportion to the original wrong (real or perceived) and completely ignores the provocation which could have led to the original "wrong". Also, no feeling of moral debt to a racially "other" person for any favors he may have done. Denial. Racist denies that the other person's or group's intelligence, cultural level, social status or other merits even in the face of overwhelming evidence which proves these qualities. The racist will attempt to "objectively" show proof, usually in the form of insignificant details to contradict the obvious. Constant references to race. A mere mention of someone's race on a first encounter could be benign but when these references continue after a long period of knowing that person, no matter how innocent the references may appear, they establish an unmistakable pattern. Antagonistic sentiments. When a person has anatognistic towards someone at first sight it is often related to skin color. The only information that one normally has about someone on seeing them for the first time is their skin color. Invisibility. An indifference to the plight of members of society who are of other races when they suffer injustices. It is typical of the racist to claim that he is under no obligation to help or that the situation in question is somehow an "inevitable" by-product of some greater good. When the great majority of members of the disadvantaged group are not of his race a pattern emerges. Presumption of racism in members of own race. Racists typically expect members of their own race to be similarly racist. This often results in expectations of preferential treatment and they expect, for example, members of their race to see the humor in racist jokes or join with them in what but for the race of the victim would be seen as morally reprehensible behavior. Condescending attitude or behavior. Racists show condescending attitudes towards members of other races. For this reason they often try to use even members of the race which they despise to attack members of that race which cause them most offense. They believe that these other members of the victimized race will collaborate because of the magnanimity which the racist is showing in momentarily treating them as members of the "superior" race. Strongest reaction to members of other race which rebut racist model. The members of the other race which a racist will typically try most to denigrate are those which act as a rebuttal to his model of what members of the other race should be. If this model is a weak, timid and stupid person, he will see a strong, independent and intelligent person of the "inferior" race as a threat to his model. If they do not attack this person directly, racists contend with this by speaking of "exceptions" to their theory. Extreme reaction to word racist. Normally the worst insult which an extreme racist can receive is to be called a racist in public. For the extreme racist it is infuriating because there is no adequate response. On the one hand he does not really want to deny it but he knows that the implications of this word are generally negative. It is not like being called stupid or ignorant, because it is difficult for him to counterattack by simply reverting the accusation. The idea that a member of the other race could look down upon the race of the racist normally challenges the model that the racist has about this other race (he typically sees it as weak, timid and cowardly). If he attempts to ridicule the other person he will publicly prove the original accusation correct. No insight into own prejudice. It is common for racists to have no insight into their own prejudice. This is because they believe their prejudice to be based upon objective grounds. Indifference to the opinions of members of the other race. It is typical of racists to e.g. make fun of members of the "inferior" race without any consideration for what those members will then think of these racists. At best, racists only care about what people of their own race think of them. Lack of impartiality. This is extremely common and affects practically all the racist's opinions and decision-making. Its effects extend beyond the obvious areas like jobs, education and housing. Veneration of great historical figures, membership of clubs and societies etc. Acceptance of racist behavior or conduct. To view "mildly" racist acts as either reasonable or, at least, not racist and to feel that more severely racist acts are wrong but "understandable". Failure to recognize impact of racism on the victim. To believe that a victim of racism can be unaltered by racism. For example, when racists examine apparent differences between members of different races or ethnic groups they completely ignore all differences in circumstances and history which could have affected the "inferior" race. Maintaining superior position "By all means possible". A phrase often remembered as a precept of the maintenance of slavery in the Southern United States during the nineteenth century. A racist will use all means possible to preserve the inferior position of the victimized race. Even a person with social motivations and benevolent to members of his own race is capable of violence and other forms of crime towards members of what he views as the "inferior" race. He could easily support the use of force to maintain those disadvantaged by racism in their present condition.